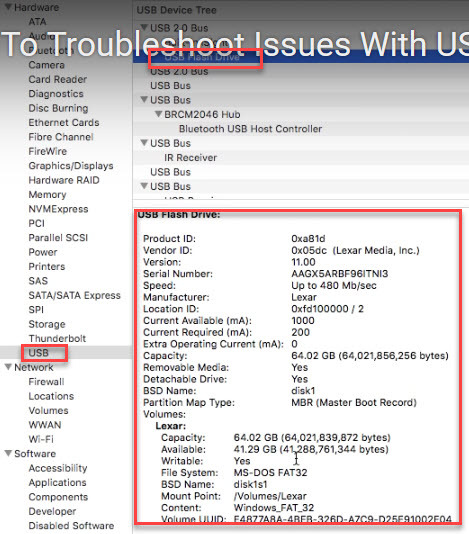 In this tutorial we’re going to show you how to troubleshoot issues with your USB flash drives(USB drive/external hard drive/SD Card) and also hard drives not showing up on your Mac computer. Error message “The disk you instert was not readable by this computer” will pop up. First thing, we need to make sure that the drives are actually having some kind of hardware, it’s at least being detected by your Mac. To do it, we’re gonna do is we’re going to go to the system information. Double click applications, and then go to utilities, and then system information. We’re trying to do is make sure the system detects the drive. Just look all the way down the list at left, looking for USB. Click the USB at left menu, you should see you drive on right. 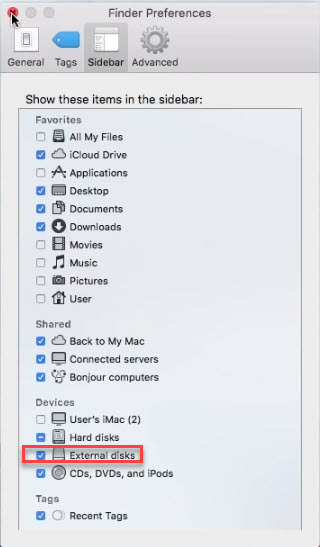 If you do not see your drive listed here, disconnect the drive and then plugging it into an alternate USB port and try to access system information again, check if the USB drive shows up. If alternate USB port works, the first USB port you use may broken. Next we’re going to go to the easy approaches. Because ordinarily when you plug it in, it’s going to show up on the desktop or it’s going to show up and finder window. Go to Finder, click preferences. And then go to the General tab. Under “Show These Items on the desktop”, make sure external disks checked. Then go to Sidebar tab, under Devices section make sure you have the external disks check. 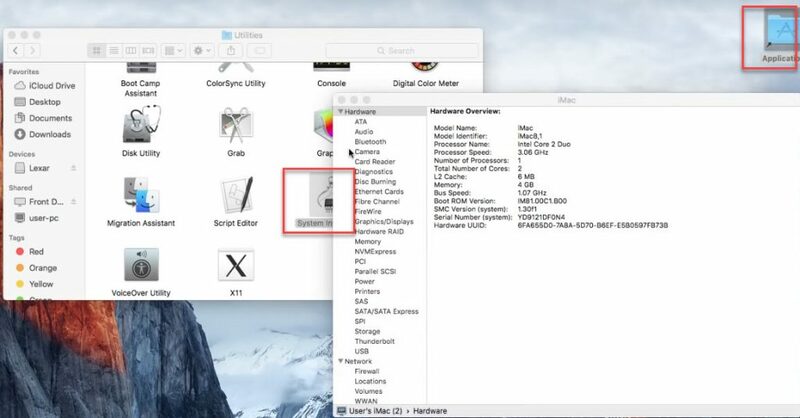 Now USB drive should show on your desktop or Finder window automatically. If the drive is still not showing up, next plan is going to be with utilizing the Disk Utilities. Back to applications again, and then go to utilities at the bottom of applications window. 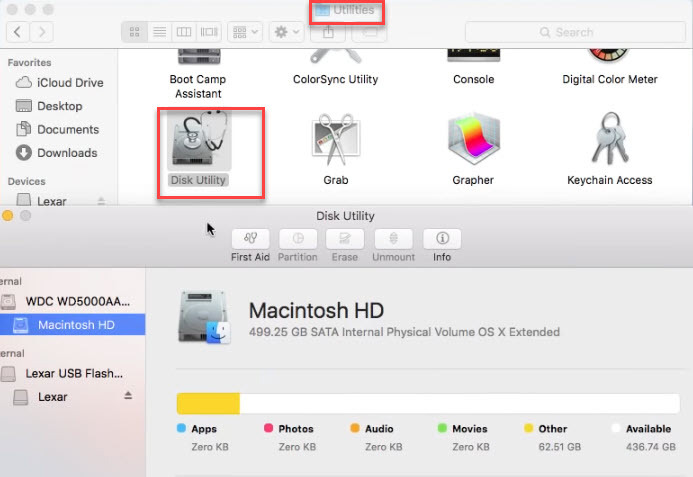 The Disk Utilities is for situation like the drive actually is detected but you still have trouble accessing the contents of it. Just clicking on the drive, click on “First Aid” and then click run button. It’s going to automatically repair any of the errors on the drive. After “First Aid” finished, unplug the disk, wait 10 to 15 seconds and plug it back in, try to access it again. If the drive still is not detected properly or it’s detected but you still cannot access the data on it, the next thing you can do is, try it in another system. 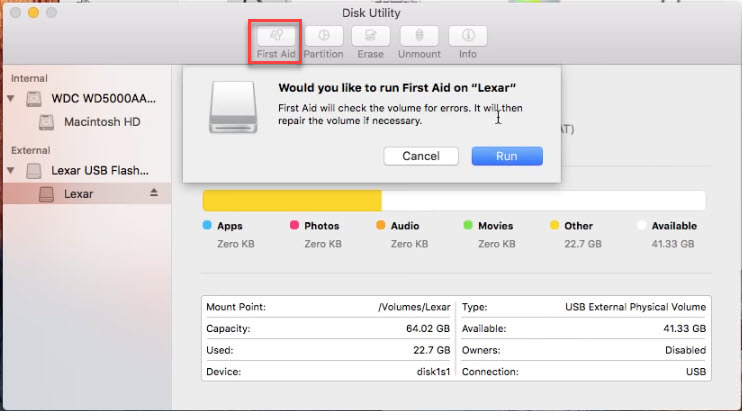 Try this disk in another Mac or possibly a PC, to see if it actually is detected correctly and if you can access the data. Go ahead and copy off all your data as much as you can. Always backup all data when you can access this USB drive. Finally, if none of these working for you, try recover data from your USB drive with Mac data recovery software, then format the unreadable drive. The recovery software will recover data to your hard disk, and you can format your USB drive so you can access it again. However, you strongly recommend you don’t copy any important data on this USB drive again because it may already broken.